1986 grey stallion. Hunter type. Multi Champion/Grand Champion! Dancer's Image and Raise A Native. 1986 buckskin Stallion. Gorgeous, rare smutty color! Live Show Champion. Bloodlines to Northern Dancer, Thatch and Viceregal. Bred by Jean Sorensen. 1989 chestnut sabino TB Stallion. Currently unshown. Bloodlines tracing to Medaille D’Or, Native Rullah and Needles. Bred by Thundervalley Farm. 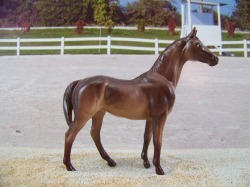 1991 Dark Bay Stallion. 2004 NAN Top Ten! 2X Live Show Halter Champion. Lines to Secretariat, Dark Star and Polynesian. 1991 chestnut stallion. Unshown, bloodlines tracing to Never Bend, the Axe and Cloudy Dawn. Bred by Randa Garrett. 1995 Chestnut Stallion. Many times champion Halter Stallion, YEA winner. Excellent bloodlines with close up crosses to War Admiral, Buckpasser and Round Table. Bred by Lisa James. 2004 black stallion. 2014 MIJC Reserve National Champion Non-Japan Stock, and 2014 Reserve National Grand champion Overall Non-Japan. Multi champion Halter horse, Live show winner. Nice bloodlines tracing to Secretariat, Black Tie Affair and Lyphard. 2008 bay stallion. Live show placed, Photo show Champion. Pedigree to Seattle Slew 2x, Mr Prospector and Alydar. Bred by Kay Myers/Caballos del Mar. 2011 bay Stallion. Champion Halter horse, LSP. Bloodlines to AP Indy, Buckpasser and close up War Admiral. Real Time bred Foxfire foal, so has permanent Foal body. 2011 bay stallion. Champion Halter horse. Bloodlines to Bold Bidder, Deputy Minister and Distorted Humor. Real Time bred Foxfire foal, so has permanent Foal body. 1988 chestnut mare. Unshown. Dam of AMAHA Reserve Horse Of the Year and Hall of Fame winning Anglo Arabian Gelding Foxfire Melvin+++. Nice lines with close up crosses to Secretariat,Tom Fool, Raise A Native, and War Admiral. 1988 bay mare. Unshown, bloodlines tracing to Hasty Road, Buckpasser and Bold Ruler. Bred by Julia Lord. 1990 bay TB Mare. Unshown, excellent bloodlines tracing to Sir Gaylord, Balance of Power and Mill Reef. Bred by Thundervalley Farm. 1992 grey TB mare. Unshown, excellent lines tracing the Buckpasser, Affirmed and Bold Ruler. Bred by Caballos Del Mar/Kay Myers. 1993 bay TB Mare. Unshown, bloodlines include Seattle Slew, Mr. Prospector, Swaps and Graustark. Bred by Ber Ali Farm. 1993 chestnut TB mare. Unshown, bloodlines to Halo and Blushing Groom. Bred by Jean Sorensen. 1994 grey TB mare. Limited showing, LSP. Bloodlines include Mr. Prospector, Seattle Slew, and Majestic Light. Bred by Me-Dow Stables. 1994 chestnut mare. Unshown, excellent bloodlines to Raise A Native, Swaps and Seattle Slew. Bred by Ber Ali Farm. 1994 grey TB Mare. Limited showing, LSP. Bloodlines to Seattle Slew and Riva Ridge. Bred by Painted Pony Ranch. 1994 bay Tb mare. Many times champion halter mare, live show placed. Bloodlines trace to Unbridled and Tom Fool. Bred by Jean Sorensen. 1996 bay TB Mare. Unshown, excellent bloodlines with a blend of German, British and New Zealand blood. Bred by Hidden Valley Stables. 1996 chestnut TB Mare. Unshown, excellent bloodlines tracing to Mr Prospector 2x, Lyphard, and Riva Ridge. Bred by Painted Pony Ranch. 1996 black mare. Unshown. Primarily Irish, Canadian and British bloodlines. Traces to Isle Of Crete, Tremblant, and Roi Guillaume. Close up cross to Swaps also. Bred by Randa Garrett. 1997 chestnut mare. Unshown, bloodlines tracing to Secretariat, Icecapade and TV Lark. Bred by Samantha Kroese/VnV Stables. 1997 dark bay mare. Limited showing, bloodlines to Buckfinder, Affirmed and Bold Bidder. 1998 black TB mare. Unshown. Pedigree traces to Black Tie Affair, Spectacular Bid and Lyphard. Bred by Dragon Star Farm. 1999 bay TB mare. Champion Halter horse/Grand Champion, dam of champions. Bloodlines trace to Danzig, Mr Prosepctor and AP Indy. Bred by Kay Myers/Caballos Del Mar. 1999 chestnut TB Mare. Limited showing, bloodlines to Seattle Slew, Graustark and Medaille D'Or. 1999 grey TB Mare. champion halter mare, champion producer. Bloodlines to Halo, Runaway Groom, Woodman and Damascus. Bred by Caballos Del Mar. 2001 bay TB mare. Unshown, nice american lines tracing to Believe It, Cure The blues and Spectacular Bid. Bred by Me-Dow Stables. 2002 dark bay mare. Multi champion halter mare, pedigree traces to Slew City Slew, Abdicating and Bold Reasoning. Bred by Randa Garrett/Twin Springs Stables. 2005 smutty palomino mare. Unshown, bloodlines to Never Bend, Northern Dancer, Milkie and Sir Woodley. Bred by VnV Stables/Samantha Kroese. 2006 bay mare. Limited showing, close up crosses to Swaps and Seattle Slew. Bred by Kathy Dodson/Me-Dow Stables. 2008 palomino mare. Unshown, bloodlines to AP Indy, Milkie, Glitter Please and Airdrie Apache. Bred by Double Hart Ranch/Cory Hartung. 2008 black mare. Limited showing with good placings. Pedigree traces to Alydar, Seattle Slew and Exclusive Native. Bred by Kay Myers/Caballos del Mar. 2010 bay mare. Champion halter mare, bloodlines to Medaille D'or, Native Rullah and Sir Gaylord. Real Time bred Foxfire foal, so has permanent Foal body. 1999 bay American Sporthorse/Warmblood stallion. Excellent show horse, multiple Live Show Championships. Bloodlines to Blackhome Duke, Glenlea Raven and Damascus. 2003 chestnut American Sporthorse/Warmblood stallion. Limited showing. 3/4 TB, 1/4 Percheron. Bloodlines to Icecapade, Secretariat and Blackhome Duke. 2004 chestnut tobiano American Sporthorse/Warmblood mare. Nice show mare, Live Show placed. Sire is Oldenburg with lines to Rinaldo and Dombuche, dam is of Selle Francais/awb lines tracing to Baccarat, Spectacular Bid and Contango. Bred by Trish Yanko/Rivendale. 2011 bay American Sporthorse/Warmblood mare. Good halter mare. 1/4 Percheron, 3/4 TB breeding. Real Time bred Foxfire foal, so has permanent Foal body. 1988 bay Standardbred Stallion. Pacer. Unraced. Champion show horse, bloodlines trace to Bret Hanover, Meadow Skipper and Albatross. Bred by Cory Hartung/Double Hart Ranch. 1998 grey Standardbred Stallion. Pacer. Unshown/Unraced. Bloodlines to Albatross (2x), Most Happy Fella and Direct Scooter. Bred by Kay Myers/Caballos Del Mar. 2005 grey Standardbred stallion. Pacer. Unshown/unraced. Bloodlines to Big Towner, Cam Fella, Mero and Meadow Skipper. Bred by Caballos Del Mar. 1993 chestnut Standardbred mare. Pacer. Unraced. Unshown, bloodlines to Chairmanoftheboard, Bret Hanover and Most Happy Fella. Bred by Cory Hartung/double Hart Ranch. 1990 bay Standardbred Mare. Pacer. Limited showing. Mostly model bred pedigree. Bred by Cory Hartung/Double Hart Ranch. 1994 bay roan Standardbred mare. Pacer. Unraced. Photo show winner, bloodlines to Abercrombie and Big Towner. Bred by Cory Hartung/Double Hart Ranch. 1995 bay tobiano Standardbred mare. Trotter. Unraced. Limited showing, good placings. Rare pinto standardbred, color comes from her sire's New Zealand bloodline. Traces to Snow Time, Most Happy Fella 2x. Bred by Cory Hartung/Double Hart Ranch.